Roadblock, a Norman Rockwell painting , appeared on the cover of The Saturday Evening Post published July 9, 1949. This is another favorite of Rockwell collectors, a classic enduring image of the world Rockwell painted. 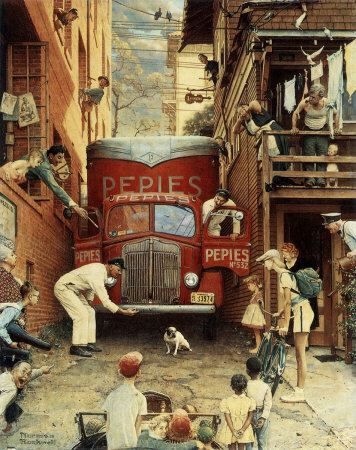 This painting was Rockwell's 260th overall out of 322 total paintings that were published on the cover of the Saturday Evening Post. Rockwell's career with the Post spanned 47 years, from his first cover illustration, Boy With Baby Carriage in 1916 to his last, Portrait of John F. Kennedy, in 1963. This was also the third cover for The Post in 1949. In 1949, there were five Norman Rockwell Saturday Evening Post covers published. The original oil on board painting, 30 x 23 inches or 76 x 58.5 cm, is part of a private collection. A study also appears on page 182 of the Norman Rockwell Catalogue. In this painting, Norman Rockwell shows us how one little creature can affect the world around it almost totally. This one little bulldog has caused quite a commotion. He has the whole alley blocked. He is not just delaying the workmen in the Pepies truck, he is keeping anyone else who wants to traverse the alley from completing their business. Twenty human characters are totally enmeshed in this little saga. The violin student cannot reach his lesson and the violin teacher cannot teach his student. The lady on the second floor wooden balcony cannot finish her laundry. Apparently, this bull is her dog, since she seems distraught at his predicament. Her husband and child are also stuck watching the dog's adventure. The art teacher and student have taken a break to watch this show also. The mailman has stopped and is also watching. The window washer has stopped to watch. The cyclist and all the children cannot proceed down the alley to their destinations. Even the cat has stopped to watch the saga. A pigeon alights on the clothesline in response to the cat's inattention. Roadblock was only one of 322 Norman Rockwell Saturday Evening Post covers; Here is the list of Norman Rockwell Saturday Evening Post cover illustrations. What will be the outcome? Will all these people be late? Will the workman ba able to lure the dog out of the way? Surely, if the truck starts moving again, the dog will get out of the way. That may be the solution. Do You Have A Great Story, Opinion Or Contribution About Roadblock?